On Tuesday, May 6, 2014, George Irving Kirkland was reunited with his beautiful sweetheart, Leah Kirkland. He has also been embraced with loving arms by his parents, Leonard Kirkland and Hazel Kirkland, and his son Lonnie Kirkland with his wife Paula Kirkland. 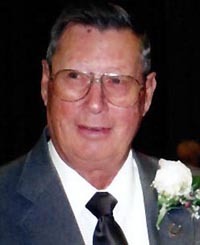 His memory and example is carried on by his son, George Kirkland, daughters, Carey Johnson, Jackie Singh, Gay Lynn Burk, and their wonderful spouses whom he loved and called his own. He will always be honored by the lives of his 20 grandchildren and 48 great-grandchildren. George Kirkland was born on Oct. 28, 1929, in Glen St. Mary, Fla. George served a faithful mission for the Church of Jesus Christ of Latter-day Saints in Texas. George also served as a staff sergeant in the United States Army based in Okinawa from Sept. 10, 1952, to Aug. 27, 1954. On Nov. 27, 1953, George married Leah Sorenson, his beloved sweetheart, for time and all eternity in the Logan, Utah, temple. George and Leah lived for a short time in Mesa, Ariz., and Boulder, Utah, where he apprenticed as a plumber. They then moved to Carey, Idaho, where they lived for over 39 years. While in Idaho, George worked as a custodian for the Church of Jesus Christ of Latter-day Saints, and as a bus driver for the Blaine County School District. After he and Leah retired they had the opportunity to serve as full-time missionaries in the historic town of Nauvoo, Ill.
George’s greatest accomplishment and joy was his family. He was a beloved father that worked hard to support his family. George taught each member of his family to love the gospel of Jesus Christ. George will be remembered for his example of faith, hard work, service, and love for others. He lived true to the Savior’s request, “If ye love me, keep my commandments.” What a great example he was to all. We, as his family, would like to thank the William E. Christoffersen Salt Lake Veterans Home and their wonderful staff who has taken such good care of George for the past year. We would especially like to thank Francita Tsinnie, who he insisted on calling Amy, and his granddaughter Nicole Bingaman for the daily love and care they gave our beloved father and grandfather. His funeral services were held at 1 p.m. Tuesday, May 13, 2014, at the Carey L.D.S. Church in Carey, Idaho. Burial followed at the Carey Cemetery.